This small bug occurs in moss, usually Sphagnum, at the margins of acid pools, lakes and streams. They are predators, feeding on small insects and other invertebrates. Adults overwinter and eggs are laid from May onwards on the roots and fronds of Sphagnum. Development takes about two months from egg, through five nymphal instars, to adult. The adults are nearly always without wings (micropterous). The map is based on records from NBN Gateway, with yellow dots showing pre 1990 records, reds dots 1990 – 2015 records and red on yellow dots overlapping records. H. ruficeps occurs widely in Ireland. 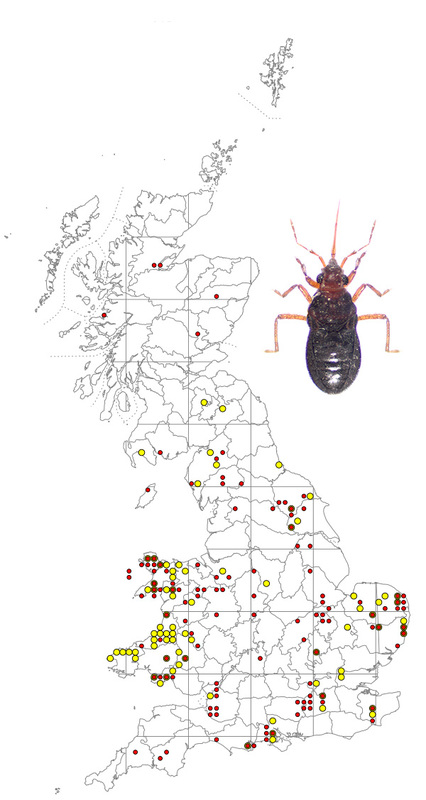 There are two species of Hebrus in Britain and Ireland, H. ruficeps and the rarer H. pusilus. They belong to the family Hebridae in the Gerromorpha – the group of mainly surface living water bugs, the most familiar of which are the water skaters (Gerridae). Hebrus spp can easily be missed owing to their small size – H.ruficeps is 1.2 – 1.5 mm in length and H. pusillus slightly larger at 1.5 – 2.0 mm.